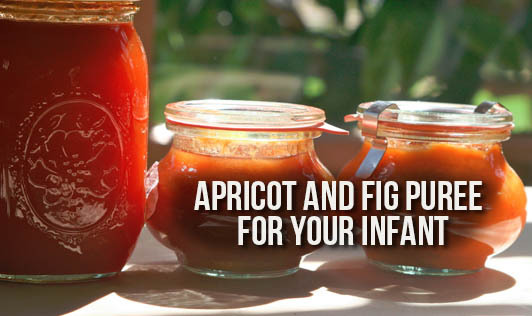 Apricot and fig puree, thinned down with milk, is a good combination rich in vitamin A and fibre. Milk adds calcium which is required for the healthy development of your baby's bones. Preparation Time: 7 to 8 mins. 1.Soak the apricots and figs in lukewarm water for about half an hour. Drain both the apricots and figs and deseed the apricots. 2.Add milk to it and liquidize in a blender to make a smooth purée. 3.Strain to remove the seeds of the figs. Serve immediately.